Superman hovers atop the Lexcorp towers, scanning the city with his senses.�His super smell finally detects something, the burning oil specific to the worker robots of the city.�His x-ray vision finds a robot clutching a police officer, preparing to kill him.�Leaping off of the tower, Superman is there in an instant, standing in front of the rogue machine.�The robot is momentarily shocked, commenting that Superman is dead, before it is knocked across the room.�Pinning it to the ground, Superman tells it that it is a robot.�It claims to be a police officer, but after a scuffle Superman drags it to a nearby mirror and proves it to the robot.�Confused, the robot charges outside and right into the path of an oncoming train.�Hovering above the scene, Superman assures the onlookers that it was just a robot; he would never let that happen to a person.�As he flies away, Clark can't help but hear the crowd mention how he should have saved the robot, and that he doesn't care about destruction of property. On a nearby rooftop, the Futuresmiths and Cir-el watch him fly away.�Cir-el asks when she can say hi to him, but the Futuresmiths tell her soon.�She then asks if he is her dad, won't he want to know she is alright.�They agree, but still insist that it is not the proper time.�The trio vanishes in a flash. Back at their apartment, Clark talks to Lois about the public's recent comments about him.�Lois tells him that even super-eavesdropping is still eavesdropping, and if he doesn't want to here it then he shouldn't listen.�Suddenly, Clark grabs his discarded uniform, puts it on and soars out of the window, only to return a moment later.�Lois yells at him for always leaving without saying anything.�Clark apologizes, and then hears a mention of a robot and Superman.�He streaks out of the window, yelling back that he's off to Swan Falls, and he'll be back in time for the Metro Awards. Arriving at the falls outside the city, Superman lands and begins to ask the man why the robot M-Nine was after him, when the man turns around and sees Superman.�It is a different guy.�The man proceeds to tell his friends about the time Superman saved him during the B-13 crisis.�Superman apologizes for eavesdropping, but the man just says that it must be great to be able to hear everything.�Superman tells him that actually it is hard to filter it all out, when suddenly he hears someone call for help.�One of the kayakers accidentally slips too close to the falls and begins to plummet over.�Soaring in, Superman fishes him out, but not soon enough. Across town, the officer attacked earlier makes his way into the city yard.�There he meets with another man who asks if he's got the goods.�Officer Peyton responds that he does, and starts to hand them over when suddenly the robot busts through a mountain of trash towards them.�Peyton dives out of the way, but the robot says that he is the betrayer of everyone.�The other man pulls out a gun and fires off a few rounds at to robot before M-Nine can swat the man aside.�M-Nine turns to find Peyton is his car and fleeing the scene.�In the next moment the robot is in pursuit. Back at the falls Superman performs CPR on the wounded man until his heart starts beating again.�As he takes off into the sky, he tells the assembled crowd that there is always justice. 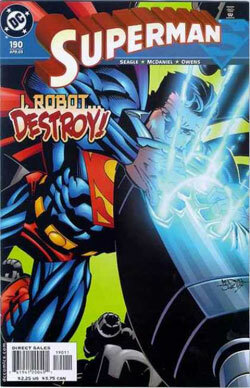 Peyton rushes to lock the door and urge his pregnant wife away from it when suddenly M-Nine's fist plunges through it.�The robot charges into the house when suddenly Superman grabs him and knocks him through a window and back outside.�Holding the machine to the ground, Superman asks why the robot is after him.�Peyton confesses in the background that he sells the social security numbers of perps to the mob.�Superman asks if that is why M-Nine is after him, but M-Nine says it is because he made him. Behind them, Peyton asks if he made the robot, but M-Nine says that Peyton didn't.�His unborn child did. The robot produces a picture of the family together, complete with a young boy.�His son invented the technology that turns men into machines, and makes them into slaves.�The robot raises his fist up to kill the couple, but Superman pulls the robot's head off.�Peyton asks what he can do to repay Superman, and Superman just tells him to turn himself in. That night, as Lois gives her acceptance speech for the Metro Award, she sees Clark walk in.�She thanks him as well.�As she sits down she asks if he heard the speech, and he tells her that he heard every word. Story - 3: This was a decent self-contained story with some bonuses.�It was nice to see someone actually dealing with the fact that Metropolis is full of stuff from the distant future and the implications of that.�Seeing Superman coming and going while talking to Lois was also a nice touch, as was his suit being compressed Silver Age-style, but don't you think Lois would have mentioned something about him doing that already?�She's been dealing with it for years.�It was also cool to see him use a super smell.�As corny as it may sound, there is no reason that every other one of his senses would be augmented except this one (he better not start licking things though).�However, there were a lot of holes in this issue too. First off, Superman is the only person in the world that can fly?�Let's see, that's right.�Except for Superboy, Supergirl, the Eradicator, Green Lantern, Martian Manhunter, Wonder Woman, Sentinel, Hawkman, and Starman; and that's not even considering the fact that they've invented flight suits as well like every Lexcorp trooper, Steel, and Booster Gold (and yes I know he's from the future) just to name a few.�I understand what Seagle is trying to go for here, but it's just not going to work in the DCU.�Second, it's going to get really annoying by issue 195 if every time he uses a power it says it.�I liked it in the 10-Cent Adventure because that was a special case.�However, if we get a box that says "Flight" every single time his feet aren't touching the ground I'm not going to be happy.�Then there is the fact that he doesn't ask the officer why the robot was after him when he was right there, and yet he leaves his wife to go and question a man whom he heard talking about a robot to ask that question.�Why didn't he just ask it in the first place?�Then I had an issue with the fact that the robot claims to be a real person made into a robot, and then Superman snaps his head off.�I realize that he was incredulous about his claim, but he should have checked into it.�The robot is from the future after all. The constant dissent from the general populace is also going to get old.�People like Superman.�They always have and always will.�They tried doing a loss of trust thing after Dominus (shudder) and that fell flat.�I don't want to have to read about people hating Superman every month because in the DCU, pretty much everyone likes him.�That's the point of Superman. I'm not going to comment on Cir-el just because I don't know where it is going.�In a few issues maybe we'll know more, but until then I'm going to wait it out. Overall, the issue had a solid premise, but it just didn't work out.�The numerous gaps in reason didn't help any either.�I read Seagle's interview and saw what he is trying to do, and I don't think it is going to work.�One of the main concepts of the post-crisis Superman has been that he is a man first, and this new emphasis on his alien status isn't going to work.�Mark Schulz did the whole sci-fi Kryptonian slant already, and he did it better than this.�I'm hoping Seagle's work improves because I really haven't been impressed yet. Art - 3: The art also did little for me.�Superman's facial expressions always look vacant and awkward and I really don't like the way his muscles look.�I did like the multiple shots to show the super speed, as well as some of the non-standard poses that we aren't used to seeing him in.�One of my favorite shots was Clark putting on his uniform and leaving again on page ten.�The art has potential, but I think the muscles and the facial expressions need work. Cover Art - 2: And the same problems from inside apply to the cover too.�Superman's expression looks blank, and his muscles are way to overdone.�It doesn't look natural at all.�They also incorrectly colored his cape above the right shoulder.�Either that or his shoulder is bigger than his head.�Combine that with the fact that there isn't a background (what's with the yellow filler in the back?) and the fact that he could be attacking M-Nine or tearing apart a random piece of metal and you get a cover that has a lack of background, isn't that representative of what's inside (unless you already know what the issue is about), and has Superman in an awkward position with a back expression.�That pretty much covers everything we need for a poor cover.